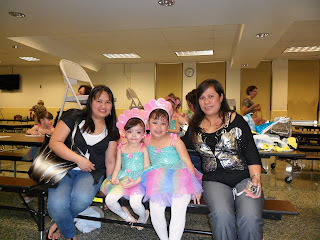 This is me and my friend and her daughter as well as our friends daughter. What's with the kids custom? They are daisy and they have a ballet dance recital that day. As Jessah's babysitter and a close friend to them, they invited me to come, join and watch Jessah's recital. I get close to the family and with the kids. Tess which is Jessah's Mom is also my son's godmother. The picture was taken before the program starts. It was held to one of the middle school in the area. There were so many cute kids out there too who have parts. There were different kinds of dance classes and it is not just the ballet. We are at the cafeteria and it is exclusively for girls only. There were boys but they were on the different room, for girls privacy. I am glad that I don't have problems uploading an online pictures. I want to share it with my friends and family who is faraway from me. I guess getting a great Internet Providers is the best deal to get especially when you are doing some works online all the time. i enjoy watching ballet recital of kids, i think they are always cute and lovely to watch.